The Laguna de Apoyo encompasses the ancient remnants of a volcano that last exploded an estimated 23,000 years ago. In the intervening millennia, a large lake has formed in the volcano’s caldera, and it’s one of Nicaragua’s most impressive natural wonders. Where is Laguna de Apoyo? The Laguna de Apoyo is located southwest of Nicaragua’s capital of Managua, between the cities of Masaya and Granada. The lake and its drainage basin are protected as the Laguna de Apoyo Natural Reserve, set aside in 1991 and managed by the Ministry of the Environment and Natural Resources. 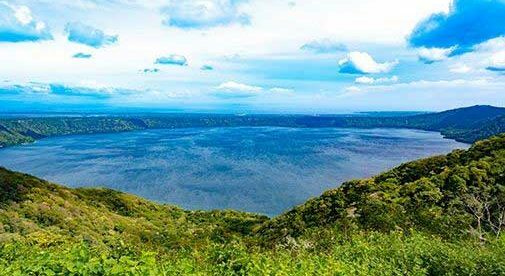 The Laguna de Apoyo Natural Reserve sits atop an active volcano, despite not erupting since a few thousand years after Neanderthals disappeared from the fossil record on Earth. But, the benefit of the volcanism is that the lake water is heated to a consistent 83 degrees F. While there are approximately 100 earthquakes per year recorded in the Laguna, these are often not perceptible by humans. Laguna de Apoyo is an endorheic (no outflow to another body of water) lake inside a volcanic caldera. The lake is approximately round with a 4-mile diameter. It is 575 feet deep and occupies an area of 7.5 square miles. The lake’s drainage basin occupies 15 square miles, capturing the rain that falls inside the old volcanic crater. Apoyo is the largest crater lagoon in Nicaragua. Since the lake’s drainage area is fairly small, forested, and contains little population or agriculture, the lake’s waters are remarkably clear. The Laguna and its crater slopes are an important habitat for a variety of species of tropical flora and fauna. There are also some endemic species, species which are not found in any other part of the world except here. The Reserve hosts a tropical dry forest ecosystem that changes seasonally. During the April to December dry season, without any rain, the vegetation of Apoyo drops its leaves and turns brown. At this time, there remain flowers and fruits eaten by local animals and migratory birds. The rainy season, from May to November, results in an eruption of growth and green foliage, and serves as a period of nesting for various animal species. Hundreds of species of plants and tropical dry trees, such as pochote, black rosewood, mahogany, marmalade plum, and guacuco, have been documented in the Reserve, as well as a large variety and amount of beautiful orchids. The fauna of Apoyo is interesting and diverse as well. There are mammals such as variegated squirrels, opossums, giant anteaters, pacas, jaguarundis, and howler and white-faced capuchin monkeys. Reptiles include green iguanas and common boas. Birds are abundant: there are oropendolas, falcons, hummingbirds, and some 65 species of migratory birds. Two hundred twenty species of butterflies have been documented in the Reserve. The water of the lagoon is home to various species of fish. Even though the diversity is not that big, there are four species of cichlids which are found exclusively in the lagoon, including the arrow cichlid. Given its proximity (less than 10 miles) to the busy tourist center of Granada, the Laguna de Apoyo is an easy day trip destination offered by many tour operators and hotels. It is possible to spend just the day and enjoy activities such as relaxing on dark sand beaches, swimming, kayaking, hiking, snorkeling, scuba diving, getting a massage, birdwatching, paragliding, boating, and nature viewing. There are also petroglyphs for those seeking to channel their inner Indiana Jones and get off the beaten path. A number of restaurants along the shore offer simple food and cold beverages. Of course, with that many options for things to do, it makes sense to consider spending a few days at one of several lodging facilities ranging from hostels to resorts. The stargazing at night is incredible when the skies are clear, as you’re removed from any city light pollution. 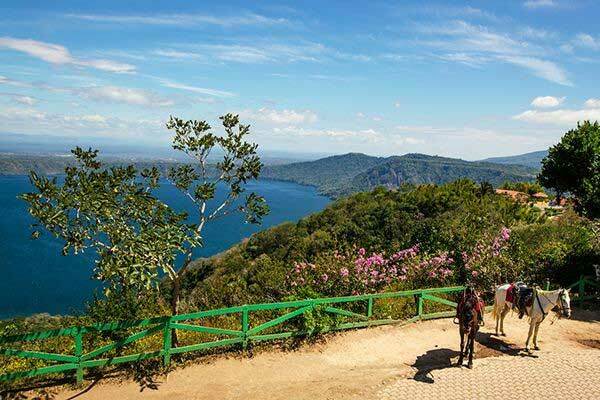 Nearby, the small city of Catarina is perched on the west rim of the Laguna’s crater, offering a stunning view of the entire Laguna de Apoyo from the mirador (viewpoint). It makes for a fantastic photo backdrop. 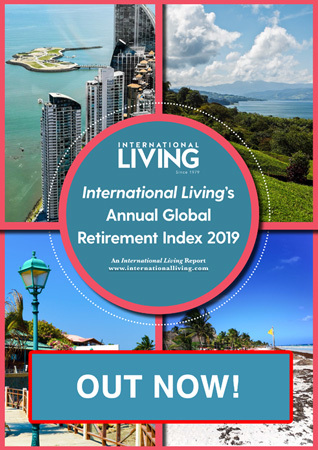 Catarina is also home to many landscape nurseries that supply an amazing variety of tropical plants and trees to homes and businesses around the country. Walking through the nurseries is worth the trip as you’ll be astounded at the beauty around every corner.